Beautiful birds. I hope they all made it through ok. Thank you Julie! I am on my second 40-lbs bag already for this winter. 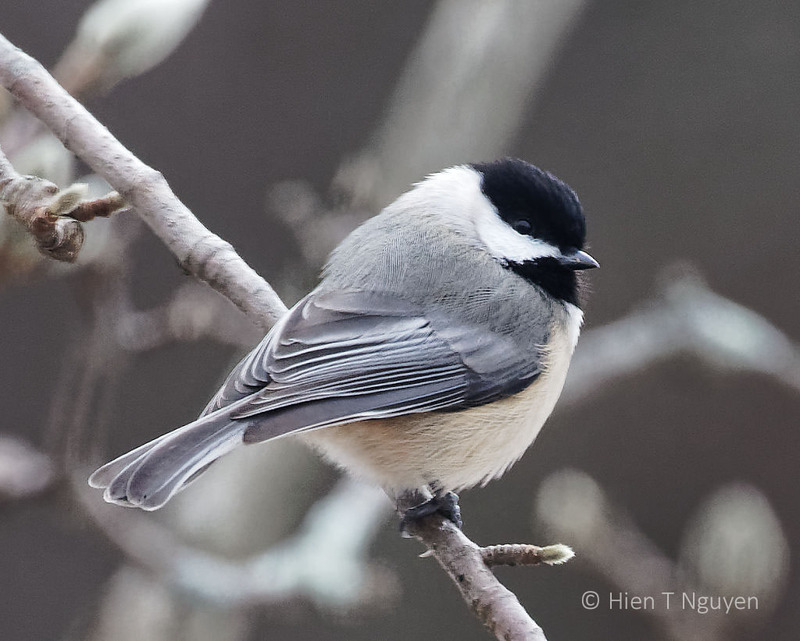 I love your photos of birds in the snow, Hien, they always look so snug and cozy. I know that’s silly anthropomorphizing, but there you are. Although I feel for the birds being out in all the cold, when they fluff their feathers to stay warm it makes for some nice images. Nice set. And we get to see them like that for 3 months every year. Thank you for commenting, John! These are beautiful shots, Hien! 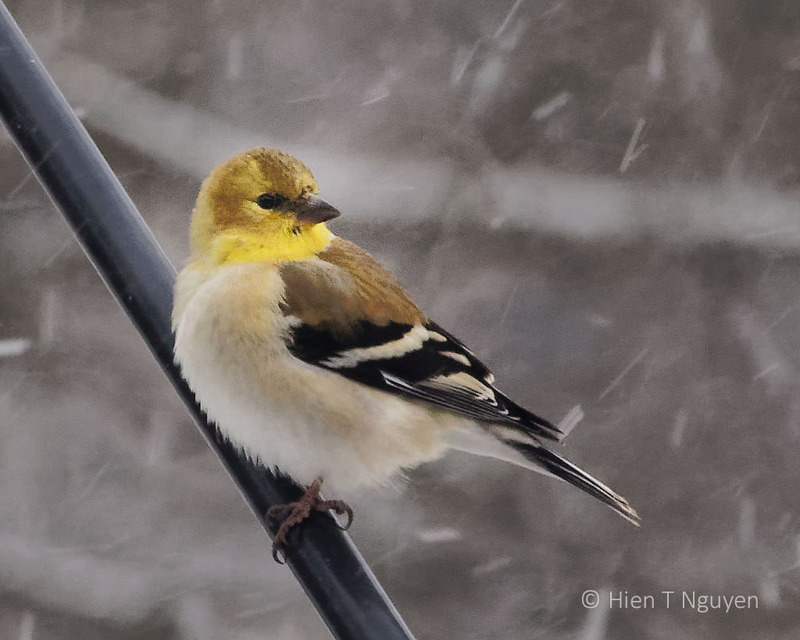 It is amazing how well birds do in cold temps and snow. As long as they have friends like you, their bellies will stay full, helping with their survival! Thank you Donna! I try to remember and stock the bird feeder before any major snow storm. It boggles my mind that such tiny bodies can withstand that terrible cold! Indeed! They are incredibly resilient, and we don’t hold a candle to them. You are an excellent bird photographer! Very good captures! Such a variety of visitors! Wonderful photos. The cold does not seem to bother the buds on the tree. It is a hardy yellow magnolia tree and has served us well next to the bird feeder! Wowza, Hien, these are all so stunning! I love when the birds puff up for the winter, they look so much more adorable! Their down jackets are much more beautiful than our manufactured ones! Thank you Donna! 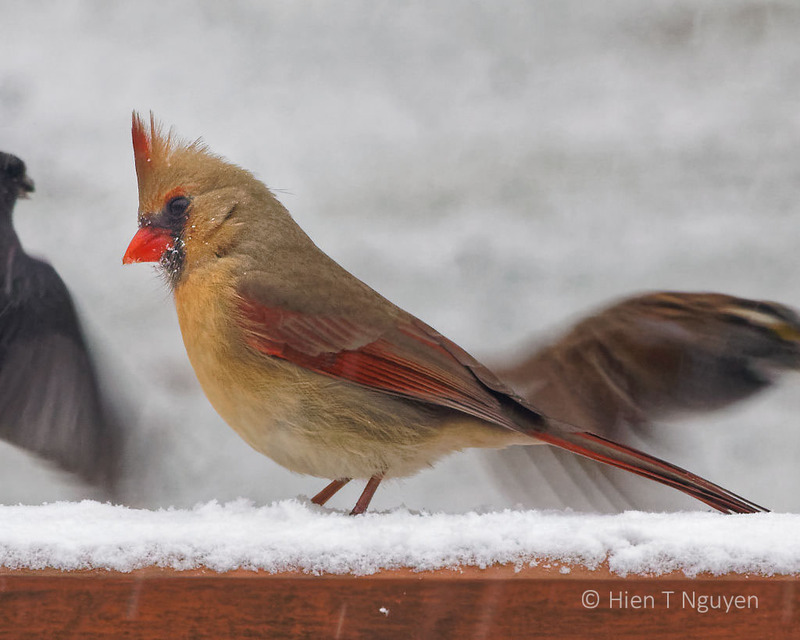 Your birds are exquisite Hien, especially the cardinals. 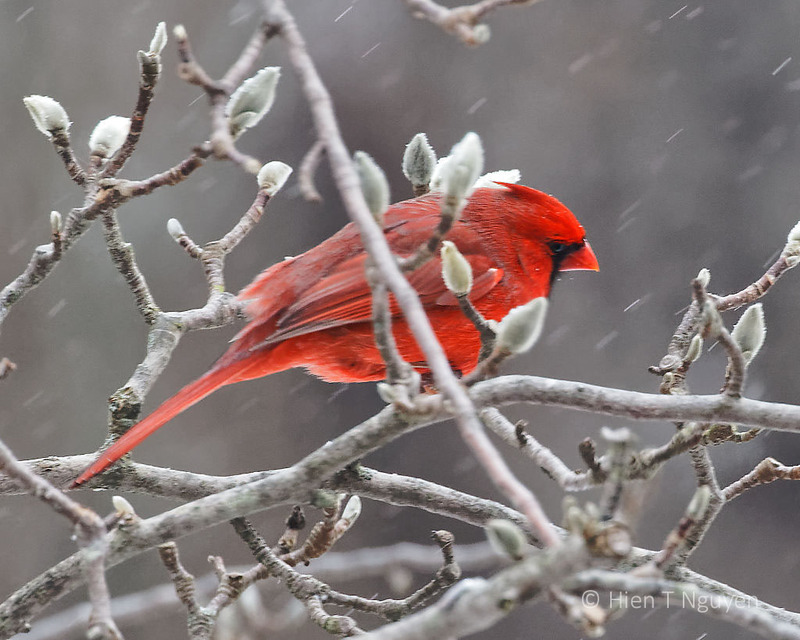 I love the shots that have snow falling around the birds! Thank you very much, Tina! Fabulous shots, Hien, they are rich in detail. Beautiful photos. Glad you are staying warm. I can’t imagine having to brave the severe winter weather “head first” like these birds must do… Such beautiful photos as always. Hope you are staying safe and warm. 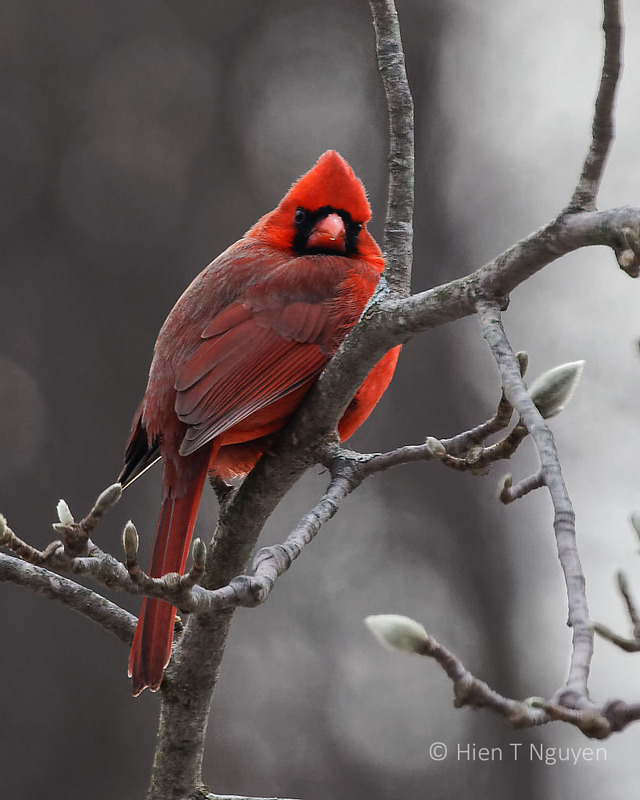 Absolutely love the Cardinal images . thanks for sharing! They seem so brave, these tiny, beautiful wild things. I lived a while in nw New Mexico and one winter the dark-eyed juncos came in clouds. I loved hearing them chatter away at the feeders! We only see Juncos in the winter, and there are quite a few of them, but not in clouds such as the ones you saw. Nice images. I hope they all did okay in the artic vortex I got cold just looking at our birds outside this week. They are very active and consumed all the sunflower seeds I had. Today I have to go out and get another 40-lbs bag! We aren’t getting as many birds this year. We’re not sure why. Perhaps it has been too cold, and some of them flew South! You might be getting all our birds. The usual suspects, except for the Goldfinch. Here, they are absent in winter. Looking in Wikipedia, they can be resident through the winter south of the Canadian border. Learned something new. A fun post, Hien. Since you mentioned it, that Goldfinch was the only one I saw recently. They don’t like it when temperatures drop below 0°F. Glad to see that you are feeding the local birds. Did you give them drinking water too? 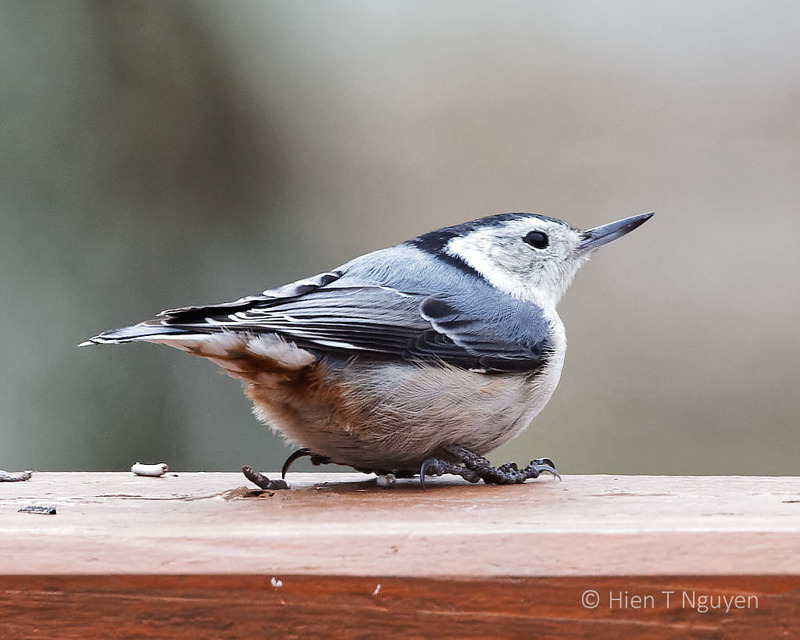 I particularly like the photo of the Nuthatch. It’s a good idea, but I did not give them water since it would freeze within minutes. If you are interested, they sell birdbath heaters that don’t cost much to run and keep the water just above freezing. If there are no other fresh water sources nearby, it could help attract more birds. Since I have so much fresh water in nearby streams, I found mine wasn’t as attractive. Thanks Eliza! We are near several streams, the main one being the Delaware Raritan Canal which is about a mile away. Closer, there are small creeks that flow less than a 1/4 mile from our house. In the winter, they may also be frozen but not for too long a time. That’s a really problem for the birds, to keep hydrated.